Albert was 20 years old, born 1894 in Middlesex England, and living in Waverley Sydney prior to enlistment and a was painter by trade. Gail McLoughlin, grand-daughter of Albert Shoosmith gives a personal introduction…..a first hand account. 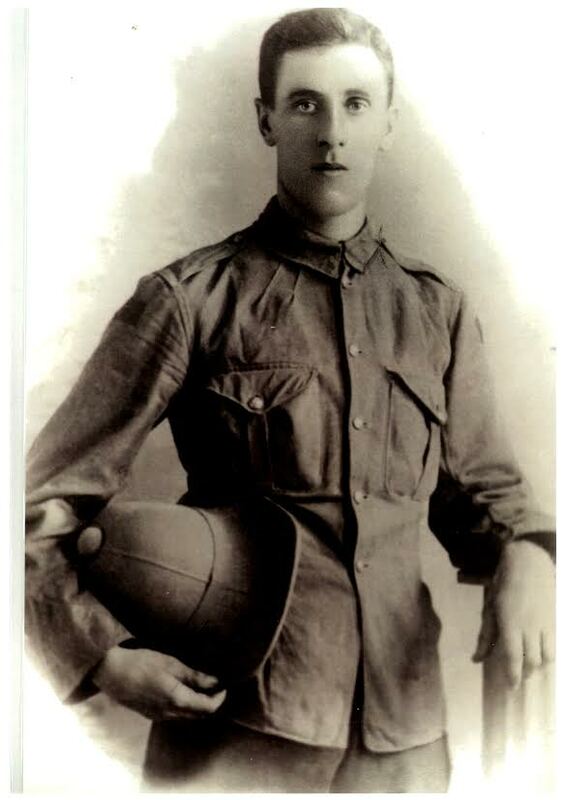 Albert served at Gallipoli up to 9th May 1915 when he was struck down with dysentery and was then transferred to Lemnos , and then onward to convalesce at Cairo. After recovering he was attached to duty with the MMP, Military police for a period with rank of acting Corporal and attached to Military Headquarters in Zietoun. In August 1916, Albert like so many MMP’s was happy to revert back to the rank of sapper and be back among his friends, and in November rejoined his unit the 1st FCE in the field in France where he stayed for the duration of the war. 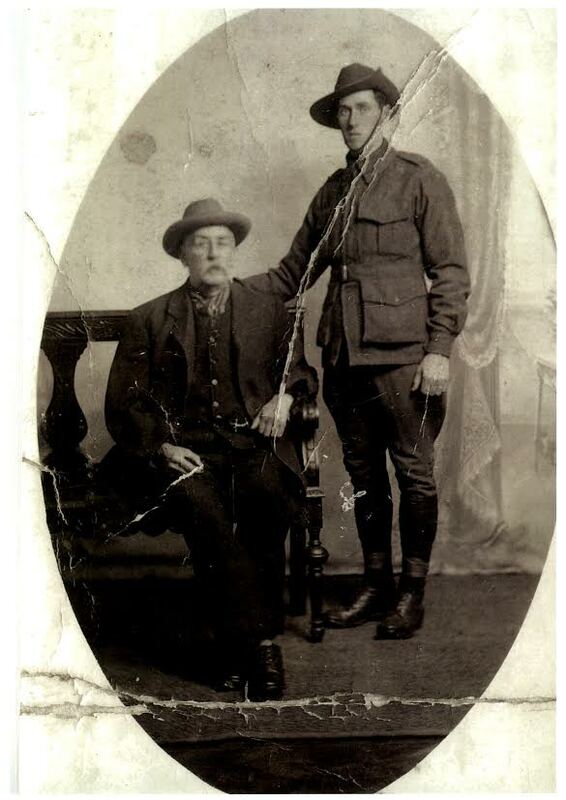 Albert Shoosmith with his father. Notting Hill 1916. The Sydney Morning Herald reported on the 3rd December 1918 the following……..
On board the “O”- HMAT Durham was 37 Albert Edward Shoosmith and Seventeen other originals, disembarking on Australian soil on the 23rd December 1918. 49 L.Cpl. John M. Atkins, 178 2nd Cpl. Walter J. Blattman, 228 Spr. W.J. Davis (Wm. J. Cohen), 148 Spr. James Dickson, 201 Spr. Herbert G. Eggleton, 92 Spr. Wm. Fahey, C.Q.M.S. John Flackfield (M.S.M. ), 161 Spr. George. C. Gear, 24 Spr. Stanley Hense, 158 CMS. James Johnston, 193 Spr. Forde Leathley, 196 Spr. Fredrick T. Meads, 68 Jack L. McMahon, 247 Spr. Fred. Pattenden, 160 L/Cpl. Percy R. Thompson, 171 Spr. Keith W. Waterhouse, 137 2nd Cpl. George E. M.Woods. It must have been a remarkable return voyage for these men , all having left the home shores four years earlier. After what they had done and what they had seen, no one could imagine the feelings they must have shared when they first set sight of Australia. When Albert returned he continued his friendships with his fellow Gallipoli and Western front veterans and was a member of the Legion club. 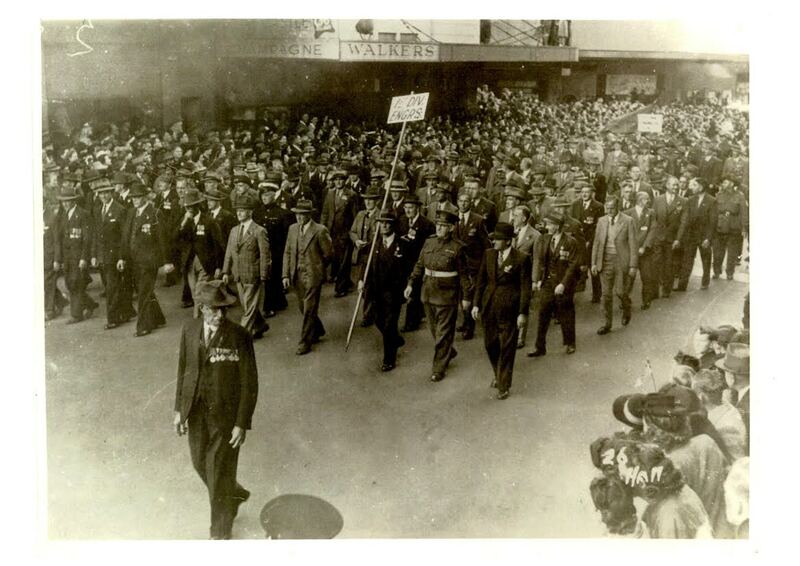 He also participated in the early Anzac marches and continued to be very proud of what he had achieved as an Engineer with the 1st Field Company. 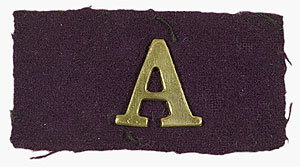 Once Albert settled back into normal life in Abbotsford NSW, the reunited members of the 1st FCE went about documenting the course of the war for the members of the 1st Field Company. They gave a chronological account from the day the company embarked on the 18th October 1914 until the final draft left Belgium in May 1919. Albert has passed on this “Short Account”, a lasting memory and an important timeline of events for the original company that is an important piece of Anzac History. The “Short Account” timeline gives some insight into the companies movements throughout the Western Front campaign, and pays tribute to many of the originals and reinforcements wounded or killed in action, and specifically detailing some of the most disastrous days for the company. During all the marching , wounding, deaths, shelling, billeting arrangements and exhausting front line work, the timeline also mentions how the men between all this hardship, found some time to hold a program of sporting events, including running races, football, and tug-of-war. Perhaps as the Engineers sat down together discussing this chapter, they remembered these rare moments together and managed a fond smile to one another. 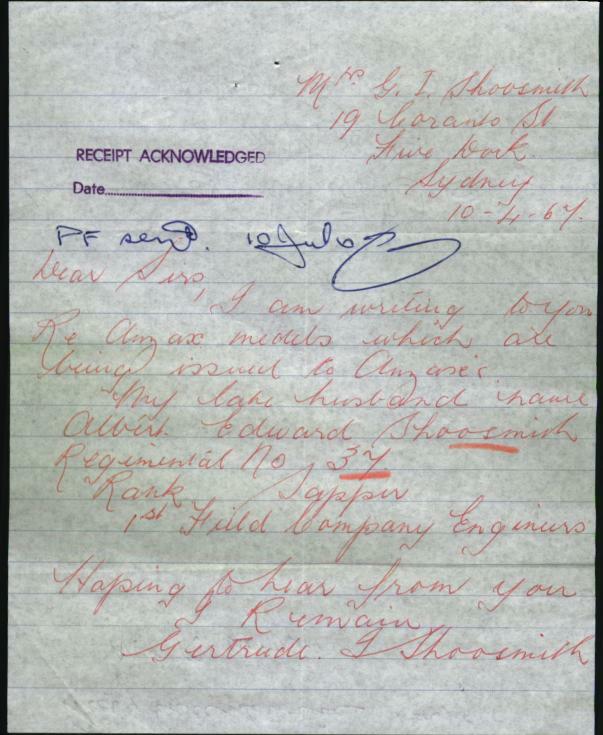 Albert passed away in 1962 , age 77, Gertrude applied for Albert’s Gallipoli medal in April 1967….her handwritten letter below. Albert’s portrait and group photos of some of the Original men are rare indeed and we are privileged to offer readers a chance to identify mates of Albert and other originals. We are lucky to have a copy of his photos and his work courtesy of Albert’s grand-daughter Gail McLoughlin who has kindly shared his memory. Gail was recently on the 100 year Anzac Centenary Cruise and spent some time at Anzac Cove for the commemorations. 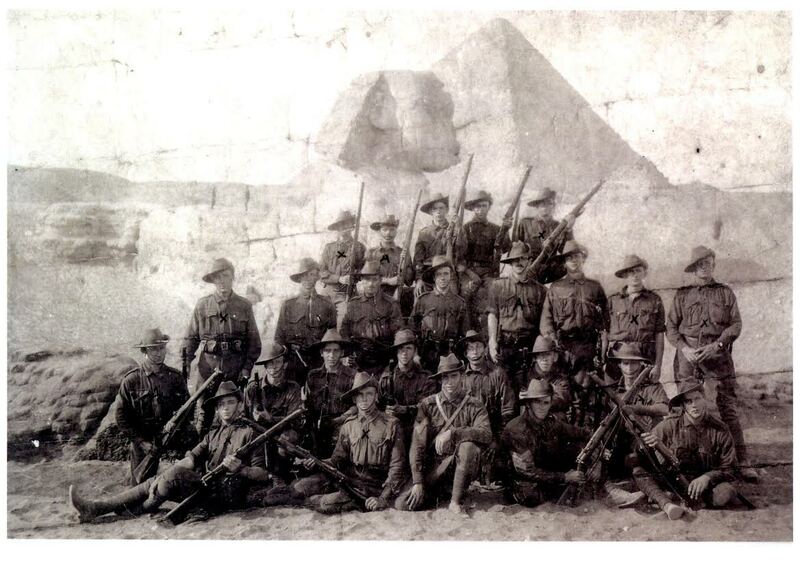 Group Photo Egypt – Courtesy Gail McLoughlin – ” Family Collection” – Albert Shoosmith 2nd row seated 3rd from right. Albert and Gertrude were married in Burwood NSW in 1923. Susan Shoosmith – Albert’s mother passed away in March 1961 peacefully at her daughters residence at 129 Hargrave st, Paddington NSW. She was 92 years old.